A developer is set to acquire land at the intersection of University Drive and Sample Road in Coral Springs for construction of a hotel, an apartment building, and retail space. Developer Ron Sheldon of Boca Raton-based PreDevCo expects to close next month on the acquisition of a seven-acre site on the southwest corner of the intersection. Sheldon would build a $168 million cluster of developments there, including a 450-unit apartment building and a 150-room hotel with its own parking garage. He also plans to build retail spaces for a grocery store and a half dozen bars and restaurants. 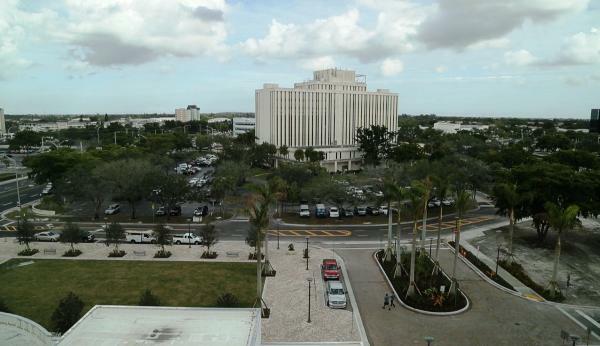 Coral Springs Financial Plaza, a 10-story office building on the southwest corner of the intersection, would be razed. Sheldon’s development would be part of the city government’s vision of a new downtown district in Coral Springs at University Drive and Sample Road. Coral Springs, which is preparing to open a new City Hall on the southwest corner of the intersection of University Drive and Sample Road, wants to sell the current City Hall location on the northwest corner to a developer. The city also may acquire a nearby shopping plaza for redevelopment. In addition, the city plans to find a new location for the Coral Springs Charter School on the southeast corner of the intersection and to sell the land there to a developer.